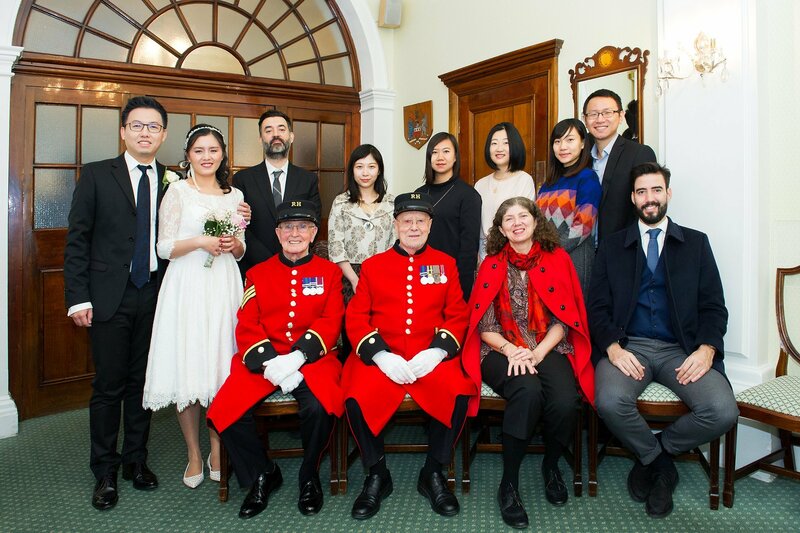 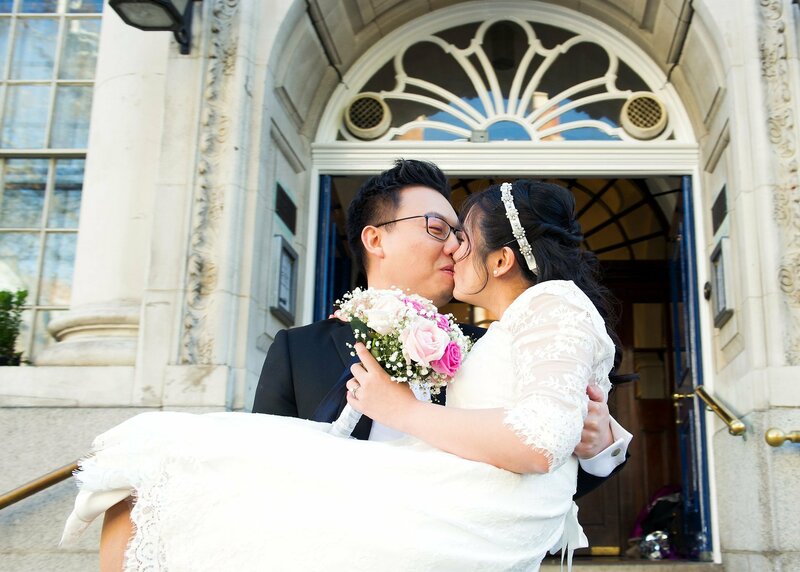 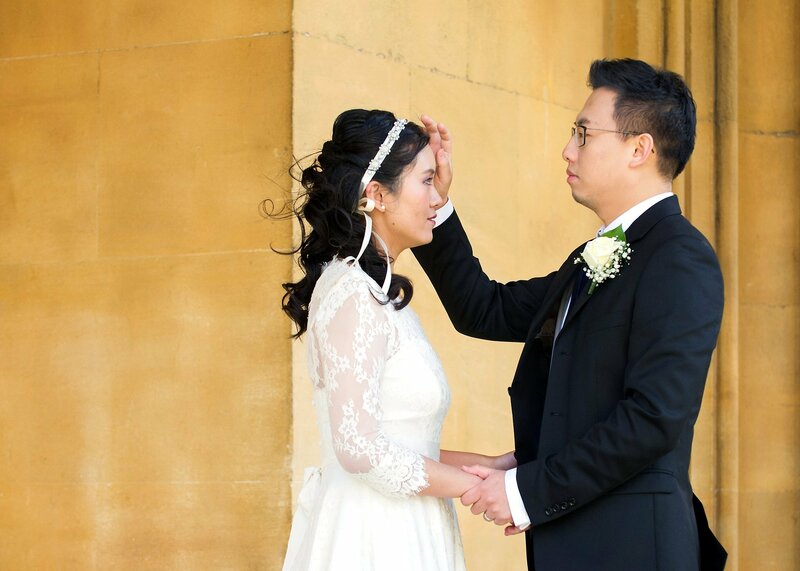 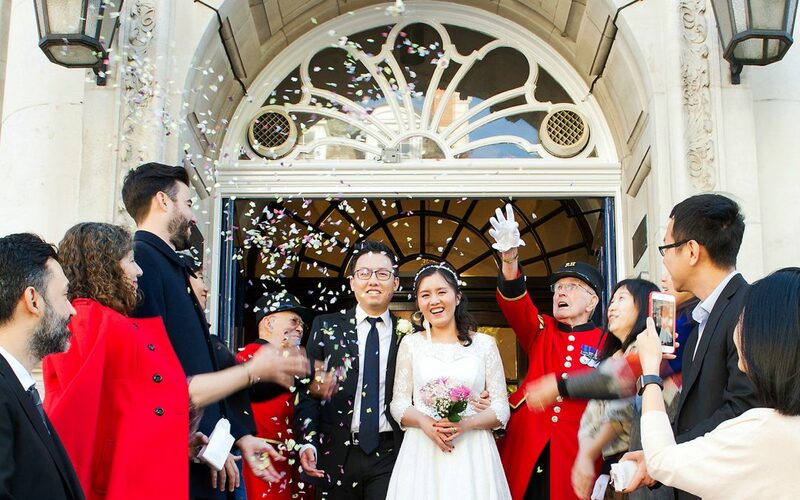 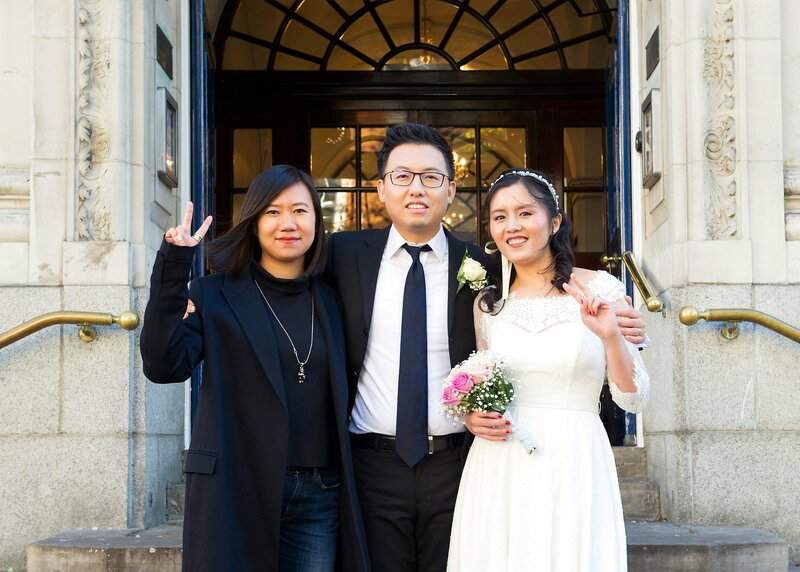 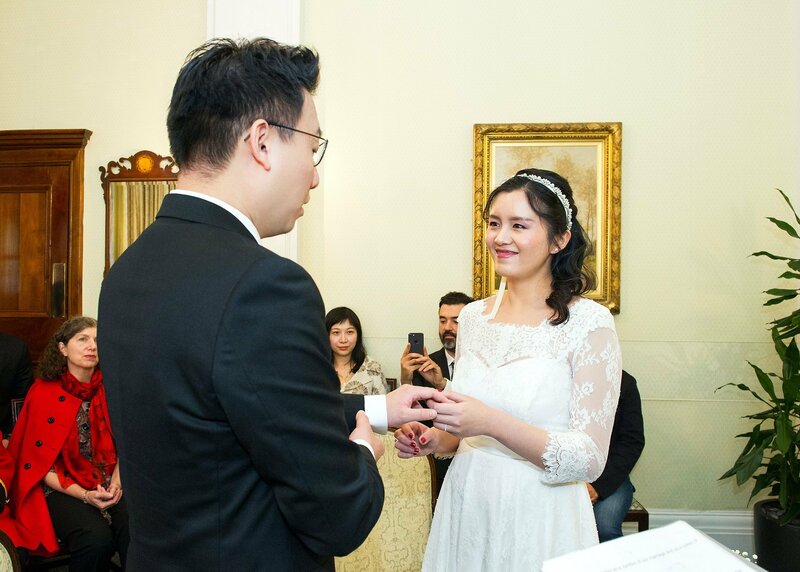 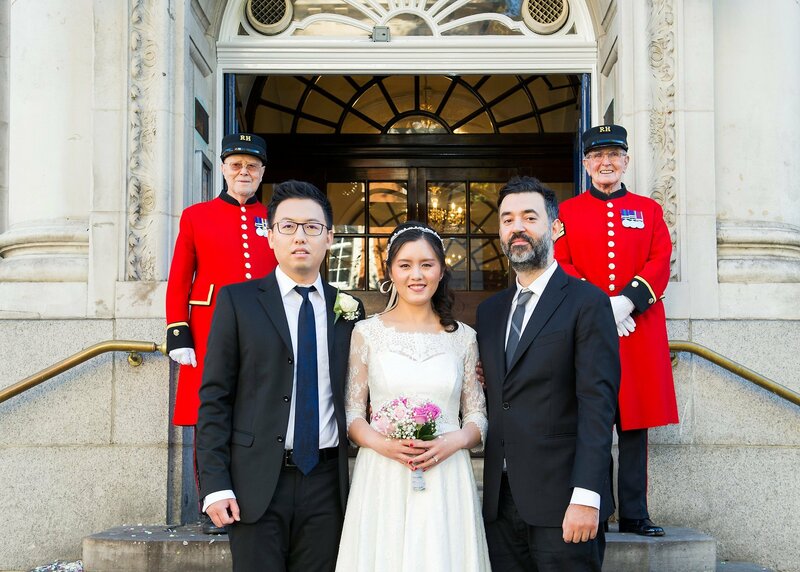 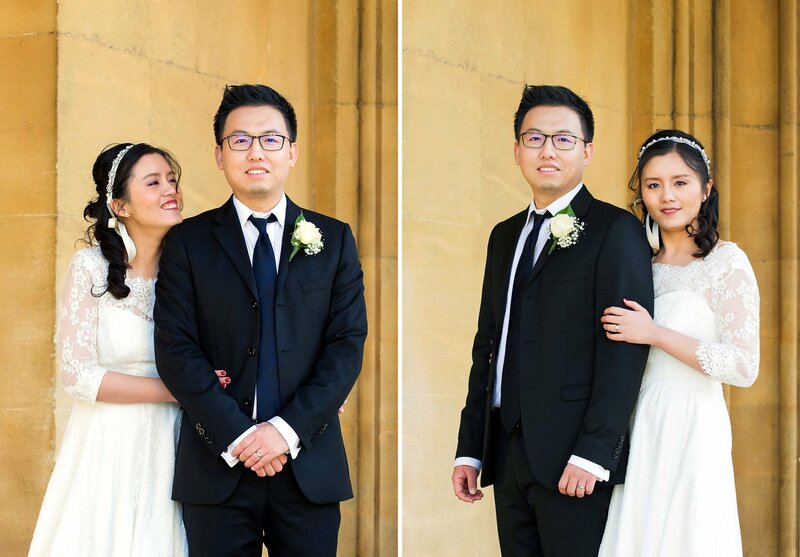 Haohao and Julian celebrated their Chinese wedding Chelsea Old Town Hall in London in late November. 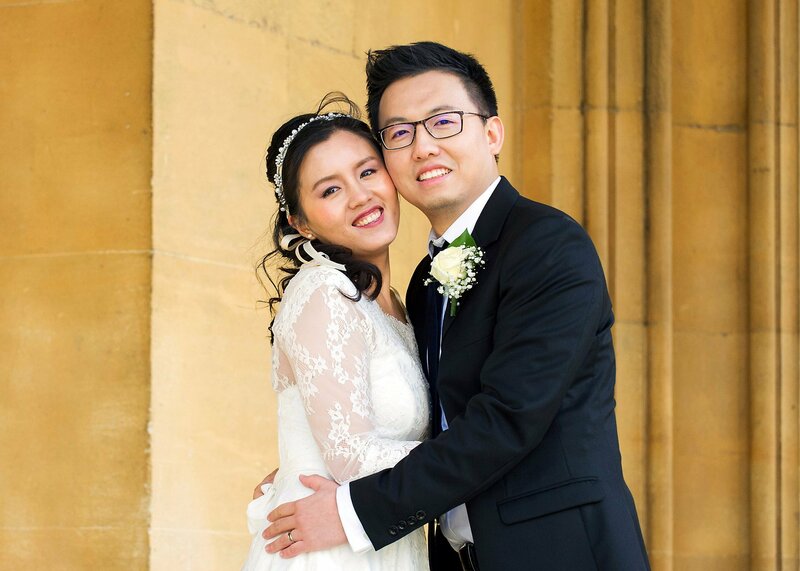 Julian very kindly sent through Facebook photos of their guests along with their names – perfect when it came to the groups. 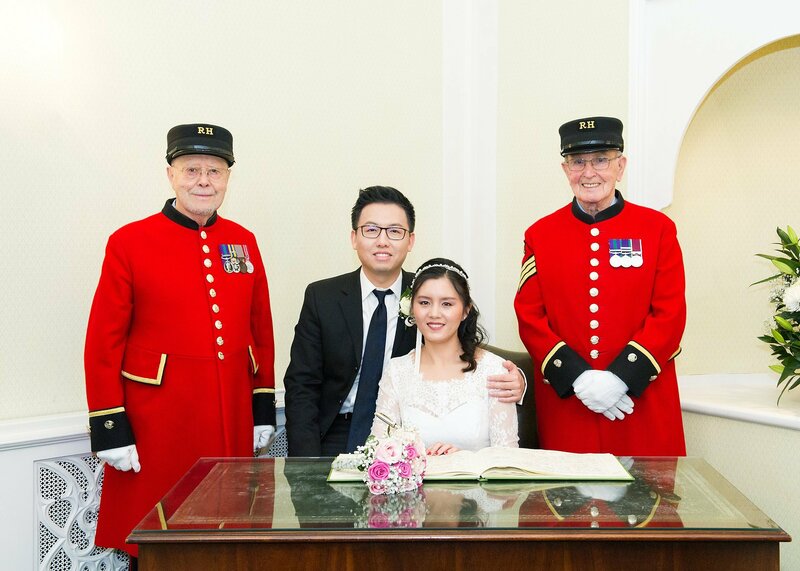 They had 8 friends and also 2 witnesses from the Royal Hospital in the form of Walter and Ron. 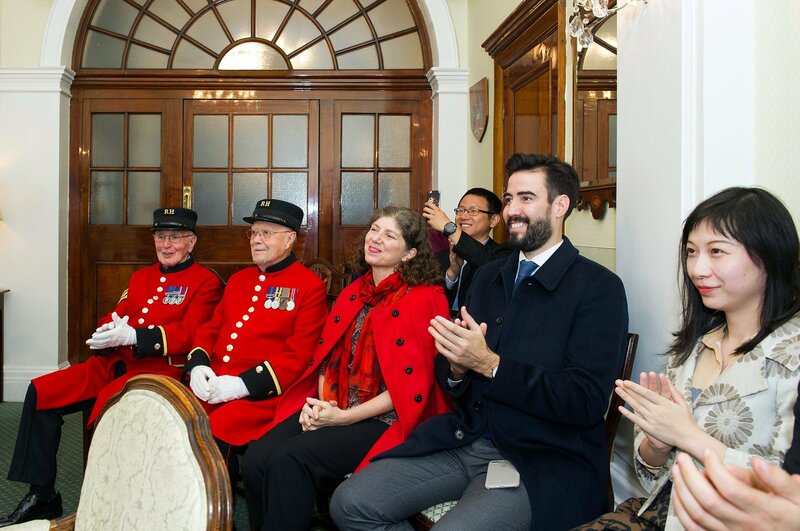 I’m a big fan of the Chelsea Pensioners. 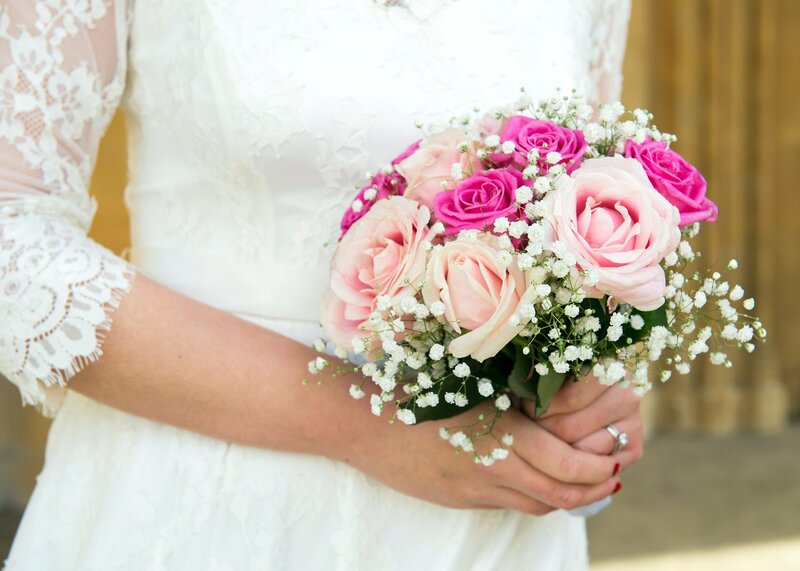 They add a splash of colour and are always so charming and fun. 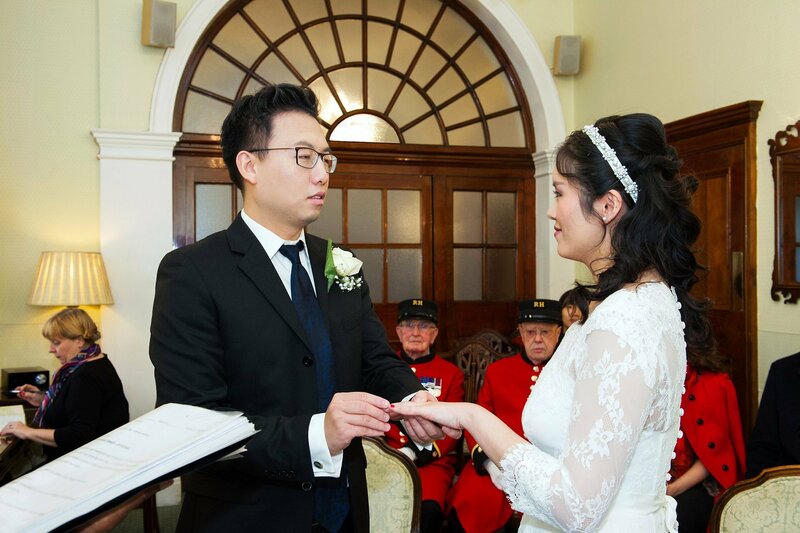 Julian said to me from our first call that she would like me to start coverage from when they entered the Rossetti Room (the smaller of the two ceremony rooms). 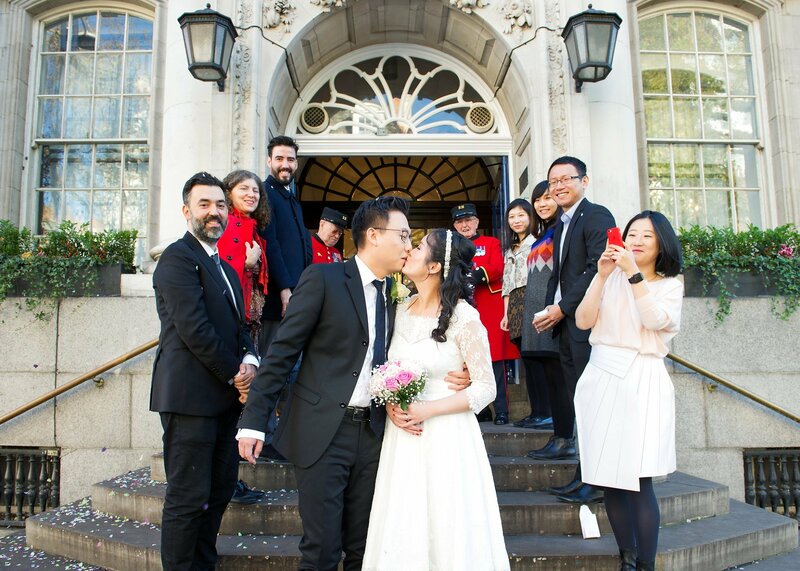 That meant that I covered the ceremony, confetti, groups and then had 20 minutes for some couple shots in nearby St Luke’s. 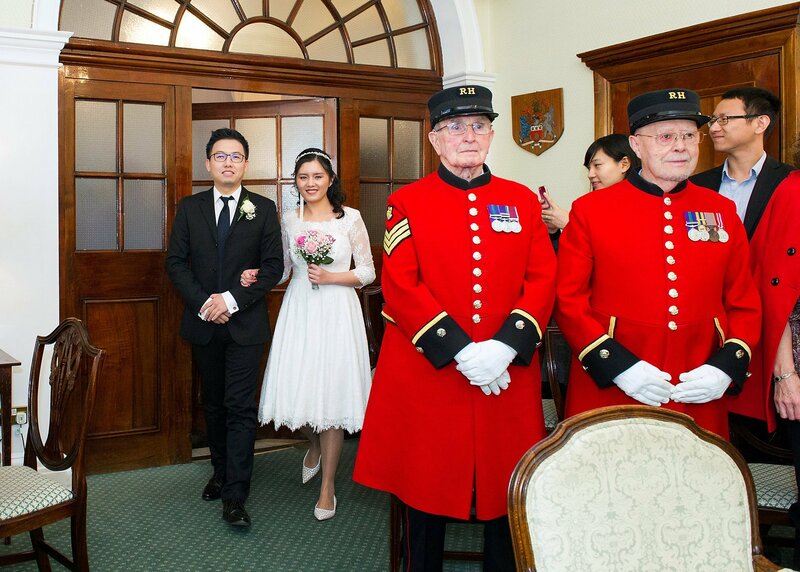 So it meant that pretty much my first meeting was seeing their broad smiles as they walked into their ceremony. 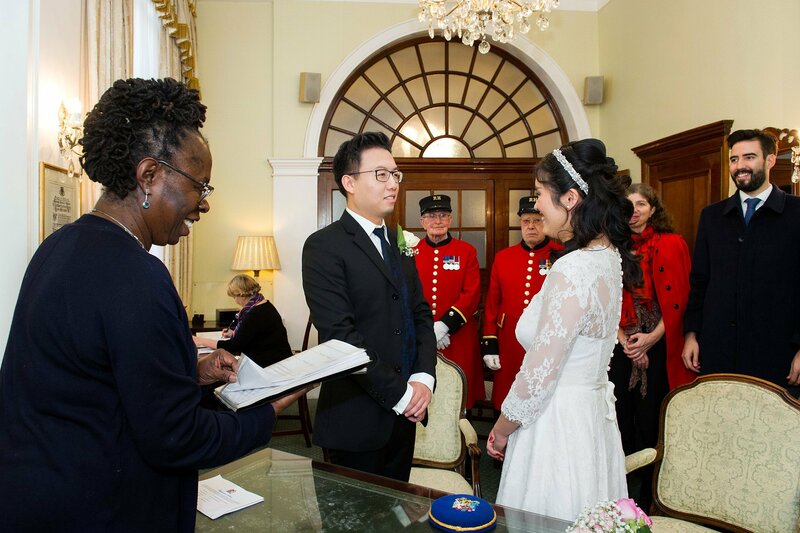 The Registrar, June, made everybody giggle from the start. 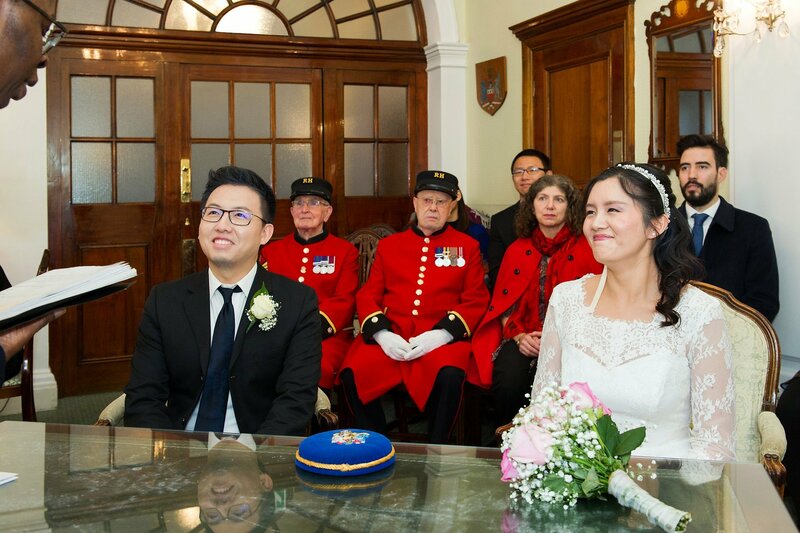 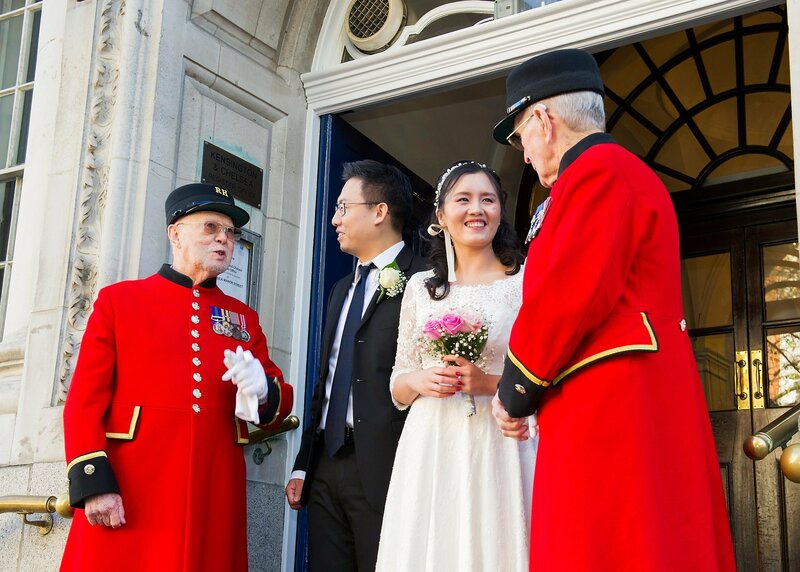 Once Haohao and Julian were married the two Chelsea Pensioners signed the Register. 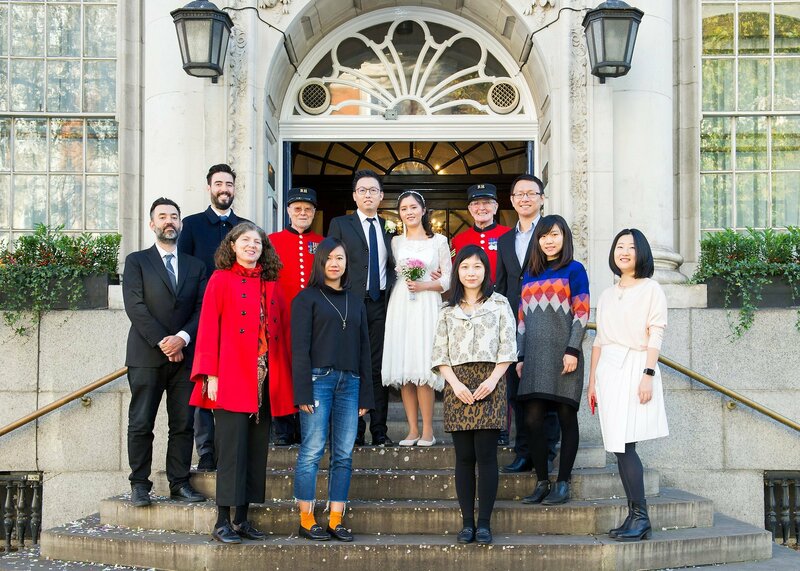 We were invited by the Registrar to take a photo of everyone in the Rossetti Room which was good because it was very windy outside. 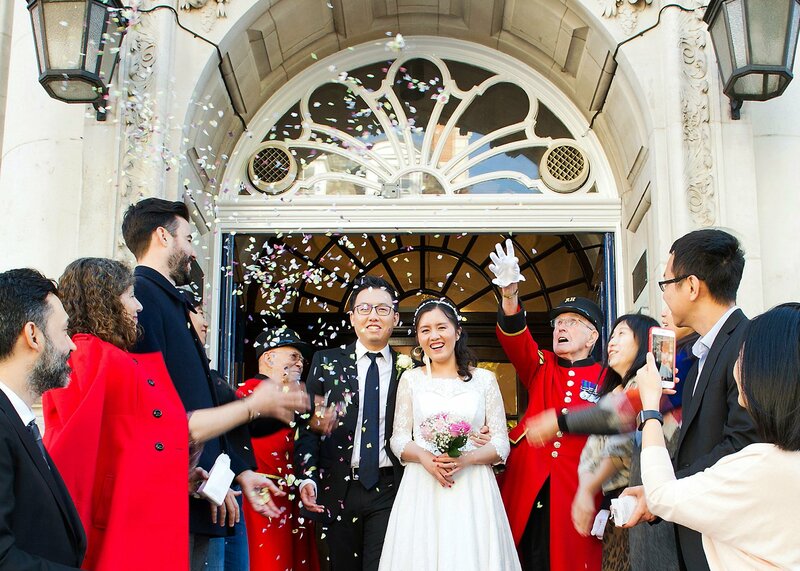 Haohao and Julian walked out to a sea of confetti and Haohao surprised everyone by lifting Julian and twirling her for sheer joy. 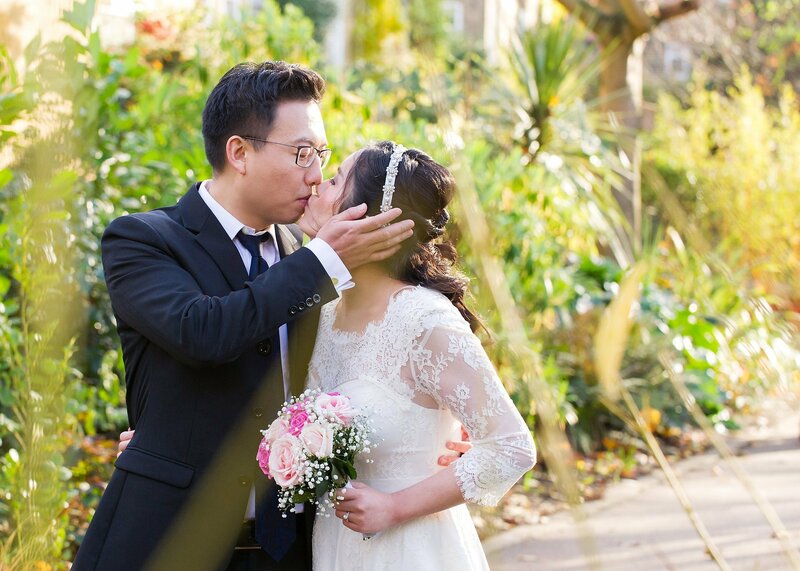 Once the groups were completed the guests headed for Daphne’s Restaurant in nearby Kensington for lunch in their conservatory. 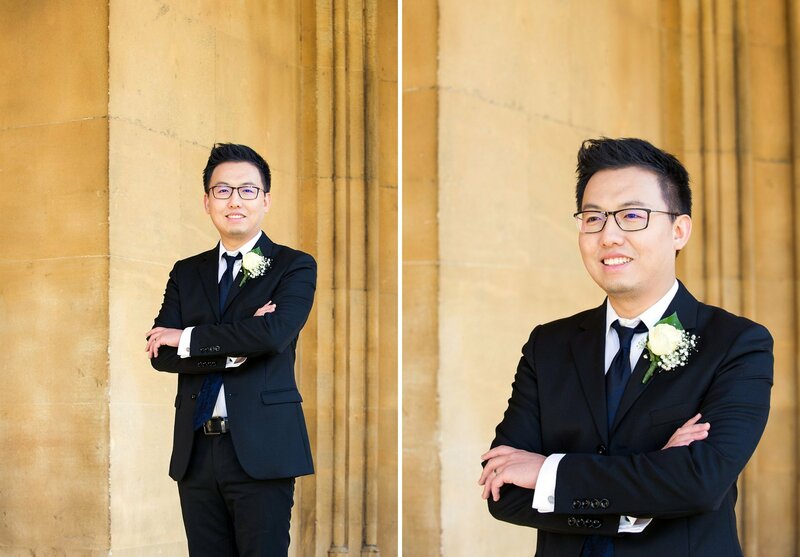 Haohao, Julian and I walked to nearby St Luke’s for their photos accompanied by Mu Ren who did a sterling job of coat holding and generally being brilliant. 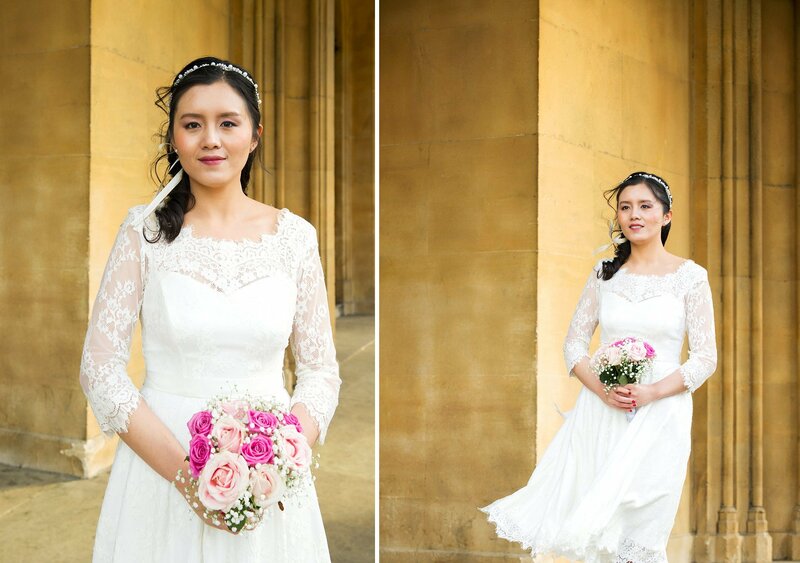 Although there was bright midday sunshine it wasn’t ideal for photographs so I used the cover of St Luke’s to get some lovely light. 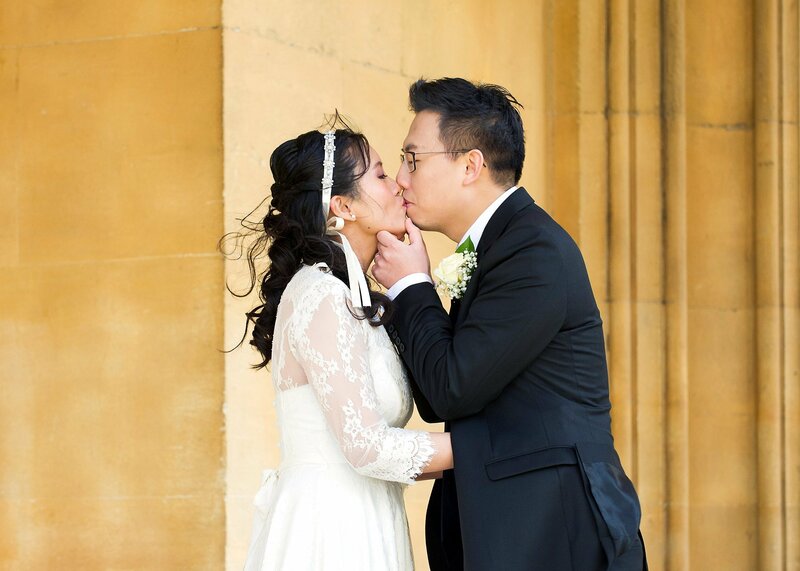 The wind chill was pretty epic so I take my hat off to both of them for braving the cold. 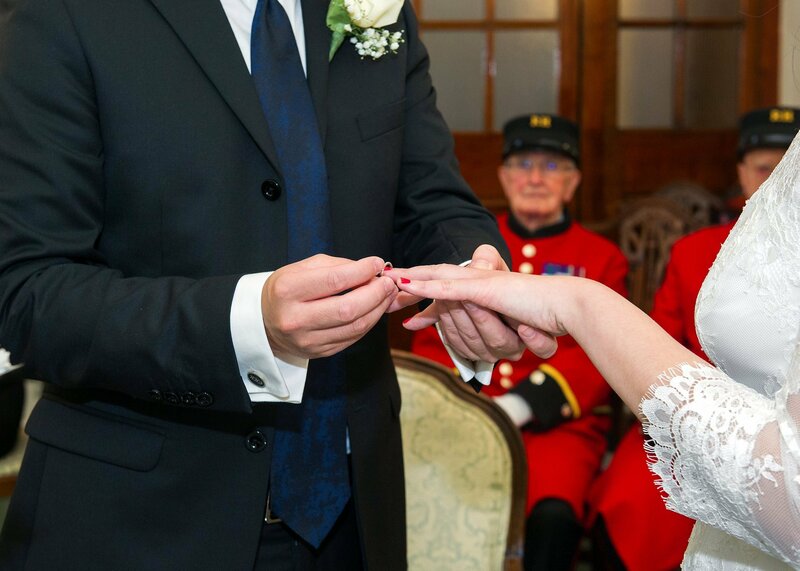 Seeing the results made it worth every minute though. 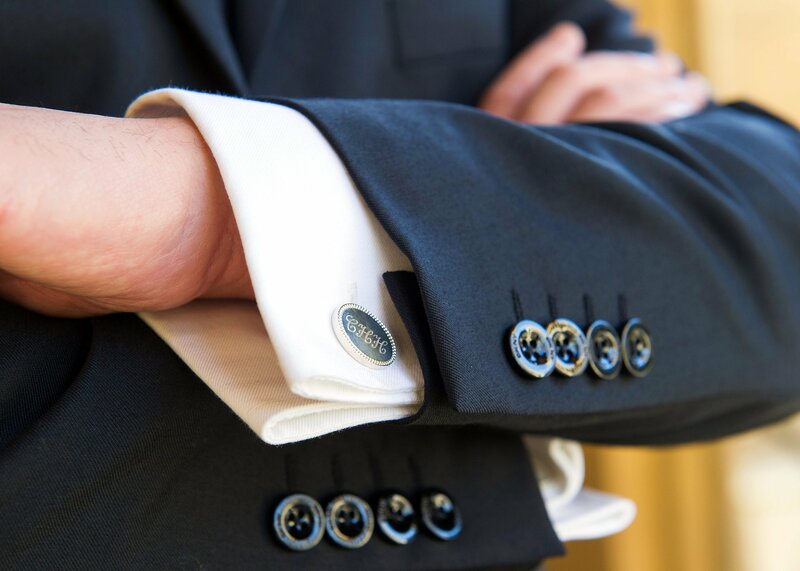 Stylish, elegant and fun. 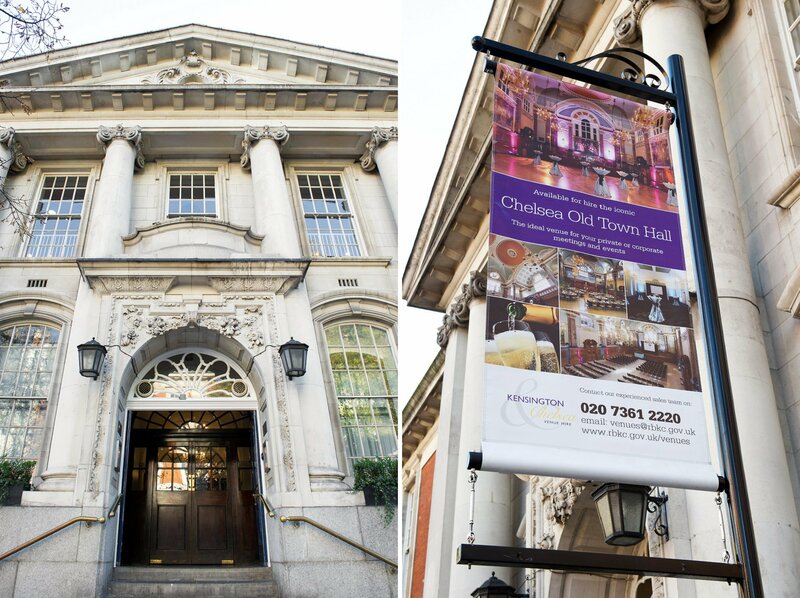 If you are having a wedding at Chelsea Old Town Hall please do have a look at my Chelsea page for more information.